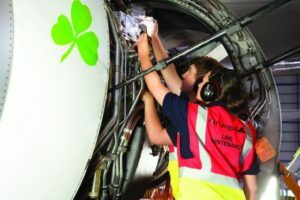 Aer Lingus said it is looking for “motivated, enthusiastic, and technically minded candidates” to apply to its annual Aircraft Maintenance & Engineering Apprentice Scheme. At the end of the four-year programme the aim is for apprentices to be fully qualified aircraft engineers and continue to work at the airline. It’s offering 10 placements on the scheme this year, and said it wants to attract more female applicants. Almost one in three (30pc) of the successful applicants last year were female. The scheme is a 4-year programme run in conjunction with both SOLAS, based in Shannon, and with Technological University Dublin. It consists of seven phases and through each phase successful applicants will move between class room training in either of the two facilities and on the job training at the Aer Lingus Maintenance and Engineering Hangar at Dublin Airport. Apprentices will be working primarily on line maintenance. Candidates should submit a CV and be aged 18 by September 1, 2019. Successful candidates will have a technical and mechanical aptitude and also display maturity, commitment, flexibility, and a willingness to accept responsibility. Communication, interpersonal and teamwork skills are also essential, it said. Apply at http://careers.aerlingus.com up till May 1.